The December 20 update from the Ohio DNR shows 299 wells currently classified as drilling in Ohio's Utica Shale. Map and data below. The 299 wells-drilling count is up 4 from the prior week. Monroe County led all in the number of wells drilling with 70 reported, followed by Guernsey (67), Harrison (64), Noble (50), Belmont (31), Carroll (8), Jefferson (4), Tuscarawas (3), Portage (1), and Trumbull (1). Antero led all operators with 60 wells classified as drilling followed by Gulfport (54), Eclipse (46), American Energy (41), Chesapeake (26), Hess (12), PDC (12), Rice Drilling (10), Carrizo (8), Triad Hunter (8), Rex Energy (4), XTO (4), CNX (3), HG Energy (3), Hall Drilling (2), Chevron (1), EM Energy (1), Enervest (1), EQT (1), Halcon (1), Mountaineer Keystone (1). Map of wells classified as "Drilling"
Despite the recent steep slide in oil prices, permits issued in Ohio's Utica Shale looked healthy during the week of December 14-20. The ODNR reported 37 permits issued in total. The permits were issued in 6 different counties and for 7 different operators. Early indications are that "sweet spots" remain economical and that riskier, more exploratory areas will see increasingly less activity. And with oil bearing the brunt of commodity price decline, gas bearing areas look to be favored. Fracking in oil rich areas also appears to be more of a challenge. A well-written article on the topic of the challenges of tapping the more oil rich regions can be found here. Map showing new permits, red indicates wells already drilling. The Dec 13, 2014 update from the Ohio DNR shows 295 Utica Shale wells classified as "drilling", up 13 from 282 reported of Dec 6. Harrison, Guernsey, and Monroe counties lead with 66 wells drilling in each. Antero leads all operators with 58 wells drilling, Noble (40) and Monroe (18). Gulfport is the second most active driller with 54 wells drilling spanning 5 counties, Monroe (29), Belmont (10), Harrison (7), Guernsey (5), Noble (3). Counties with wells classified as "Drilling"
Harrison (66), Guernsey (66), Monroe (66), Noble (50), Belmont (30), Carroll (8), Jefferson (4), Portage (1), Trumbull (1), Tuscarawas (3). Antero (58), Gulfport (54), Eclipse (45), American (37), Chesapeake (29), Hess (14), PDC (12), Carrizo (8), Triad Hunter (8), Rex Energy (4), XTO (4), CNX (3), HG (3), Hall Drilling (2), Chevron (1), Enervest (1), EQT (1), Halcon (1), Mountaineer (1). Map of Utica Shale Ohio wells classified as "Drilling"
In this post we look at the decline rates of the top five gas producers from Q1 2014 in Ohio and see how they did over Q2 and Q3. Much has been written about the steep production decline curves of shale wells over time, a common and expected occurrence. There is reference to high IP rates or high Initial Production compared to UR or Ultimate Recovery. We still don't have a lot of data on longer-term Utica Shale well decline rates in Ohio and what each well will ultimately produce, but as more data comes in we get a better idea. Bending the production curve and sustaining production is the goal. Once a particular well has "paid-out" or paid for itself based on investment and profit, the rest is gravy. It is important to appreciate that many factors go into decline rate. As technology improves and production practices are optimized, decline rates should also improve. Each operator is looking to find the right mix of technology and practices to squeeze the most Ultimate Recovery from their assets. And as a well's production declines operators may look into some form of well intervention that might increase production and/or allow production to be sustained for a longer period of time. As an example of decline rates, lets take a look at the top five gas producing wells from the Q1 2014 Ohio DNR report, and now, with 2 subsequent quarterly releases, how those wells fared over time. The chart shows just how quickly production declines, a star in one quarter can continue to produce at a relately high rate, but rates decline sharply, not a surprise to those in the industry and nothing to be too concerned about, this is very typical in shale plays. The MCCORT well is unique from the other four in that the well produced for just 32 days in Q2. [All data is averaged based on Gas Production/Day. See charts below for more]. Excluding the MCCORT well, the others, top 5 gas producers in Q1, ranked 12,13,16,and 20 in Q2, and then 45,47,49, and 67 in Q3. 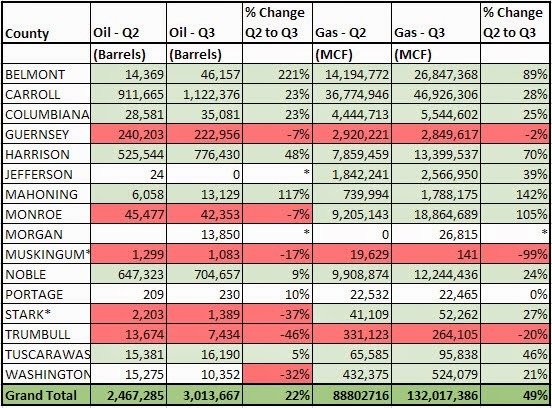 So there you have it, a look at five highly-productive wells over 3 quarters and what production decline looks like. Stay tuned for more analysis and reporting of Ohio's Utica / Point Pleasant Shale play. Diving a bit deeper into today's Ohio DNR data release, next up. Cells in red show a decrease. Belmont County is the standout in Utica Shale gas production and gas production increase. Fifth in oil production and second in gas production, Belmont also showed the largest real increase in gas production, up 12,652,596 MCF. Not far behind is Carroll County, up 10,151,360 MCF and Monroe, up 9,659,546 MCF. Carroll County leads both gas and oil production by county and continues with production increases for both oil and gas. Harrison County is the clear standout in increased oil production, up 250,886 barrels in the quarter. 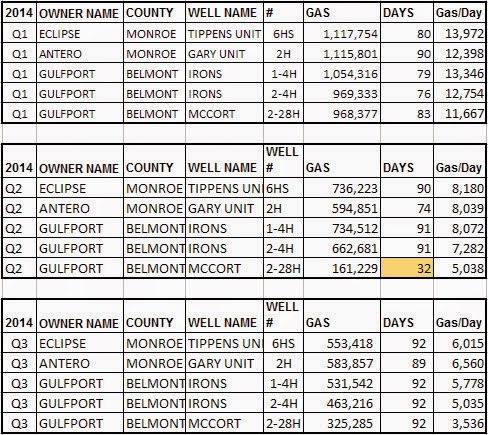 And Harrison also logged a 5,540,078 MCF increase in gas production, just behind the increase witnessed by Monroe. Guernsey County continues to produce both oil and gas at decent numbers, though not increasingly so. As of the Nov. 29, 2014 Ohio DNR report we noted that Guernsey is still very active with 50 wells drilling, exceeded only by Harrison and Belmont counties which show far more significant increases in production. With so many wells drilling we should see some good Q4 2014 and Q1 2015 numbers from Guernsey. In subsequent posts we will look at production trends for individual wells to see if there are any clues there. Stay tuned for the next post where I will look at individual wells and production results, followed by map updates and a look at decline curves. 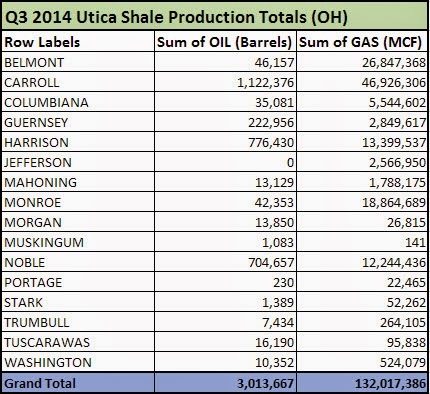 The Ohio DNR has just released Q3 2014 production data for Ohio's Utica Shale. I will share a brief analysis here and follow-up with more detailed analysis, maps, and charts as done previously. 258 Utica / Point Pleasant Shale wells in Ohio are classified as "drilling" in the November 29, equal to what was reported November 15, with a few changes noted with (+) or (-). Data source: Ohio DNR. Harrison (63), Monroe (61), Guernsey (50), Noble (44), Belmont (24), Carroll (9), Jefferson (4), Portage (1), Trumbull (1), Tuscarawas (1). Antero (55), Gulfport (49), Chesapeake (31), American Energy (31), Eclipse (27), Hess (14), PDC (11), Carrizo (8), Triad Hunter (8), Rice (4), Rex Energy (4), HG (3), XTO (3), CNX (3), Hall Drilling (2), Chevron (1), Enervest (1), EQT (1), Halcon (1), Mountaineer (1).